I did try and weed some of the flower beds this year, with the intention of planting bee and butterfly mats (pre-seeded mats that you roll out to grow wildflowers specifically for butterflies and bees). Then I realised I was weeding out wildflowers to grow more wildflowers in their place, which seemed a bit pointless. So we’ve ended up with a patchwork of expensive cultivated “wild” flowers and our original mix of weeds “au naturel”! Well at least we don’t have to weed the tree. The tree is in fact an early season Discovery apple tree, which in a good year produces masses of lovely sweet apples (many of which end up in a friend’s cider press). 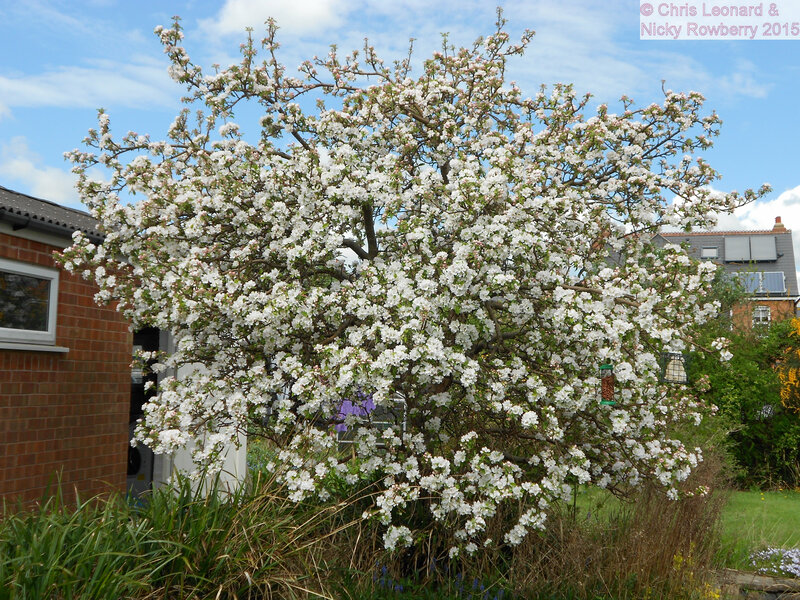 In spring it is a mass of blossom, buzzing with bees and crawling with insects for the local birds. The hedge didn’t really start off as a hedge, but was originally a series of individual bushes, neatly pruned and spaced along the fence at the back of the garden. Under our expert cultivation, they have morphed into a tangled thicket of dense undergrowth. This has the benefits of providing privacy from the neighbours beyond (who are either delighted at no longer being able to see into our wilderness or horrified at the wall of encroaching green they see beyond their fence) and providing shelter and food for the insects, birds and hedgehogs that now frequent it. Not sure what shrubs were originally in there, but it is now a thriving mix of Buddleia and Berberis, brambles and bindweed. Well to call it a pond these days is stretching the definition of “a pond” a bit. It is more of an enclosed rectangle of soggy loving weeds growing out of a layer of damp gloop. There is however just enough liquid left on top of the mud to support a few frogs and newts, with the occasional toad putting in an appearance too. Pond snails and water boatmen fight for space amongst the duckweed and fallen leaves. 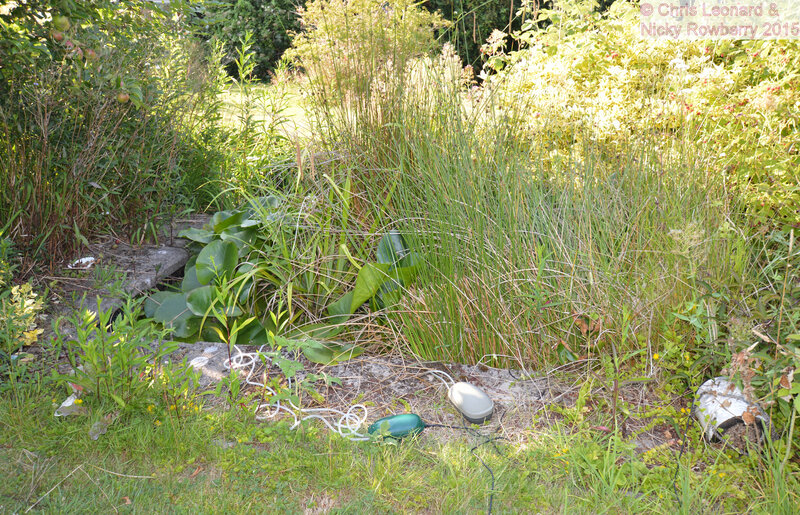 We inherited this pond when we bought the place and have long intended to dig out a “proper” pond; but along with being too lazy to weed, I guess we are too lazy to dig as well! When we first moved in, we had two perfectly weed free, well maintained and productive veg plots – one either side of the garden. We now have two perfectly weed filled, sporadically maintained veg plots. They are still very productive, it’s just that what they produce is not necessarily edible, unless you enjoy teasels and sticky buds for lunch. We do still attempt to grow veg; this year courgettes, runner & borlotti beans, carrots and kohlrabi are fighting to stay ahead of the game and the asparagus is still valiantly battling with its very own beetle variety. The use of the word lawn, is probably some kind of breach of the trade description act. We have two areas of green mossy carpets, punctuated by the odd thistle. I should probably give in and just let them turn into meadows, but even lazy gardeners like somewhere relatively clear to sit and drink the odd glass of something chilled in the summer, so they do get mown occasionally. It also helps when putting out the moth trap to have a clear bit of ground, rather than having to machete a space each time.